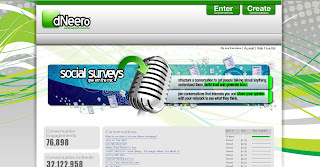 One of the first earn-money-online sites I joined when I started blogging was dNeero. If you have no idea what it is, it's a social networking site that allows its members to answer social surveys, post the conversation on their sites and then earn money after it has earned 5 days of impressions. One can also share his or her opinion on Twitter Conversations posted on @dNeero. It has been a while since I last joined a conversation. The last one I joined was in July 8, 2009 and I was really glad to receive an update from the team, a simple survey to answer and an all new look which I think is better than the old one. I have already received my first payout of $20.27 last May 11, 2009. I have a current balance of $4.89. 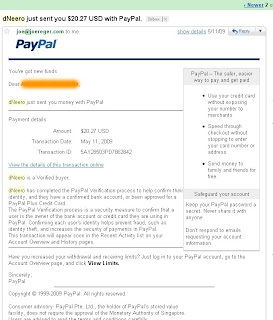 Payouts are given when you reach $20.00 or more via Paypal. With things turning around again at dNeero, I hope to reach the $20.00 mark soon! Interested, join us and be a dNeeroite!